Hi Dunwoody North! We are happy to see you are interested in the 2017 DNCA Neighborhood Directory Cover - Art Contest. Well, the entries are posted and voting has started so clik here to cast your vote. As you know, the DNCA publishes a neighborhood directory every three years. Well, it's coming again this spring. If you are between six and twelve years old, the DNCA would love to have your art on the cover. Honestly, it's OK to have a DNCA logo on the front but... Pretty boring so let's spice things up! Artists must be Dunwoody North residents between 6 and 12 years old. No help from parents, older siblings, friends, etc. Corlette Muery, our board member managing this contest was an art teacher so she really can tell! 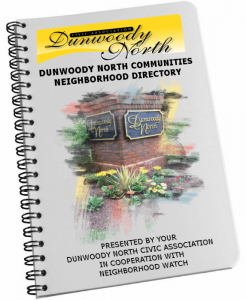 The drawing should depict something of importance to you in Dunwoody North. This could be anything, your home, the entrance to the neighborhood, your sandbox, the pool, kids playing - Really, whatever you want as long as it somehow depicts the neighborhood. You should use a full 8.5” x 11” sheet of white paper. That way when we scan it into a digital file, it will have enough detail to print really well. The picture should be drawn vertically not horizontally. That way it will properly fit the shape of the front cover, which is vertical. You may draw in colored pencils, crayons, or markers, your choice. PLEASE, Do Not Fold or otherwise reduce the size of or damage the drawing area as that will blow up the scanner. Well not really but getting a good scan will not be possible so it may have to be disqualified. The artwork may be signed on the front if desired but very important, please print your first and last name on the back edge of the paper. This is critical so we don't get drawings mixed up and please try to not disturb the art on the front - For example, do not use a magic marker to put your name on the back as that will bleed through to the front. Please include your full name, birthday, parent/guardian’s name and contact information on a separate piece of paper and include it with your submission. Especially important are a good phone number and email so we can get in contact with you. Depending on the number of entries, the DNCA Beautification Committee will nominate up to seven drawings and post the nominations on the website. There will be a link on this page to the nominations but you will need to be logged-in to get there and to vote. If you are not yet registered, please sign up. Voting will begin in mid-November and the results will be known in December. Check back here later in October for definitive dates. DNCA members will be able to view and vote for their favorite artwork with a special email form and note, ONLY 1 VOTE will be counted per registered member. The first place winner’s artwork will go on the cover. Depending on the space available, artwork from runner-ups will be included elsewhere inside the directory. If you have any questions, there is not a lot of time so please contact us ASAP. You can also email the Beautification Committee using the form at the right of this page. You can also email the Webmaster using the form at the right of this page.